If you've been getting into the Stand Up Paddle scene over the last few years you've probably realized it's a really great way to explore previously unsurfed areas as well as your local waterways. Now you may be ready to take your skills on the road and explore someplace new. 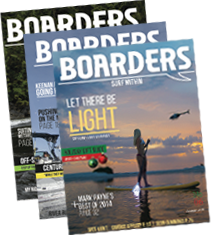 Are you yearning to embark on your own paddleboard travel adventure but don’t know where to start? Here’s a list of five exceptional and unique SUP getaway destinations and accommodations. So just sit back, relax and day dream about your next SUP trip. The Waikiki of Mexico, this laid back and tourist-friendly area is only 20 minutes from the airport in Puerto Vallarta and SUP is taking off in a big way down there. From the point break in funky Sayulita, to the rolling waves of Anclote, or the downwinders along the sparkling coast, this gorgeous peninsula is set up perfectly for stand up paddle fun. When you go, check out the beachfront Cinco Hotel. This upscale hotel is doing a fabulous job of catering to the SUP community. The owner has teamed up with the Pipe Master himself, Gerry Lopez, to offer SUP and yoga camps (next one is May 24-26). Not only does the hotel have SUP boards on site for guest use, but the rooms also look directly onto the Anclote surf break - known as one of the best beginner waves in Mexico. Perched atop a bluff with commanding views of the dazzling coastline and passing whales, this 2 bed/2 bath condo unit is an ideal home base for paddlers. The owner - a gracious host and avid SUP enthusiast himself - is happy to share his local paddle knowledge with guests. If you’re up for a real workout you can take the stairs from the condo directly down to the beach and paddle along the cliffs or do some surfing at the beach break. Yes, there is good SUP and sometimes waves and "warm" water in the Great Lakes. Hawaii’s North Shore has one of the most concentrated stretches of surf breaks in the world. Summer visitors will enjoy clear waters and calm conditions while each winter the North Shore comes alive with huge swells. Many of the surf breaks here are best suited for expert surfers but there are some wonderful spots for stand up paddling, even if you're a beginner. 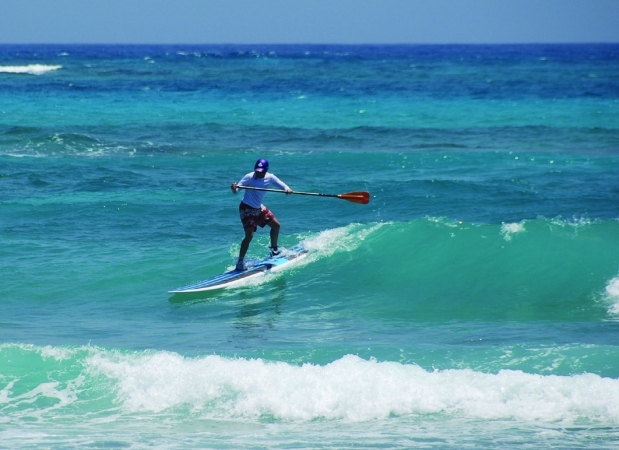 Try the scenic paddle up Haleiwa River or the beaches surroundingTurtle Bay which have played host to many SUP events. Located on a picturesque point, the Turtle Bay Resort offers SUP lessons and rentals and has plenty of turtle filled lagoons to explore as well as world class waves. The hotel offers incredible ocean views or choose one of the Ocean Villas and stay just steps from the waters edge. Playa Guiones, Costa Rica - Where jungle meets the sea. Sunrise paddle in the waves with howlers monkey's calling in the distance. Waikiki, Oahu, Hawaii - SUP paddlers playground. Gentle waves and calm waters are ideal for first time wave riders. Surfer's Point, Barbados - Blue water and a forgiving point break make this a popular spot for SUP. Tofino, Canada - Breathtaking, and not because of the cold water. Temperate rainforest meets an unspoiled coastline with unlimited paddling choices. Treasure Cay, Bahamas - All girls SUP camps with clear water, white sand, unexplored islands and small waves.